Furyborn. Claire Legrand. Young Adult/Fantasy. 2018. 512 pages. 4.5 stars. 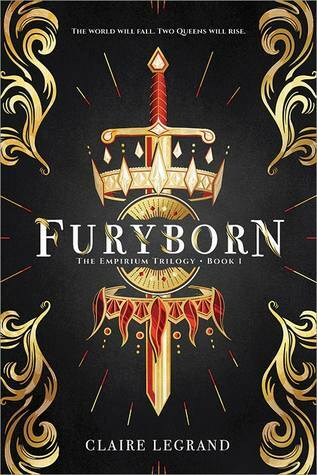 I was so excited when I found out that I received an ARC of Furyborn, and I’m so happy to say that I enjoyed it so much!! Furyborn was reminded me of Empress of a Thousand Lanterns, but waaaay better. It’s told in alternating points of view, and I enjoyed each POV equally. It’s pretty rare that I don’t favor a certain point of view. It’s just written so well that each chapter ending made me want more! Furyborn’s strength is definitely in its writing, and it’s really obvious that the author put a lot of thought into the plot line. It’s just so intricate and well woven. My only qualm about this book is that I wish we’d gotten to know the side characters some more! I feel like it was too focused on the two main characters. I understand that it’s the first book in a series, so I guess there will be more characterization in the sequels, but it just leaves me so curious and wanting more. I’m so excited for the sequels. This is such a solid start to a brilliant and new series. I was still debating on this one, but I may add it after your great review! Previous PostPrevious It’s Our Blogoversary!